We have set the basic blog, though it may not look great because of the theme which we are using, but we will change those. Presently we will focus on taking this blog for the world to see. 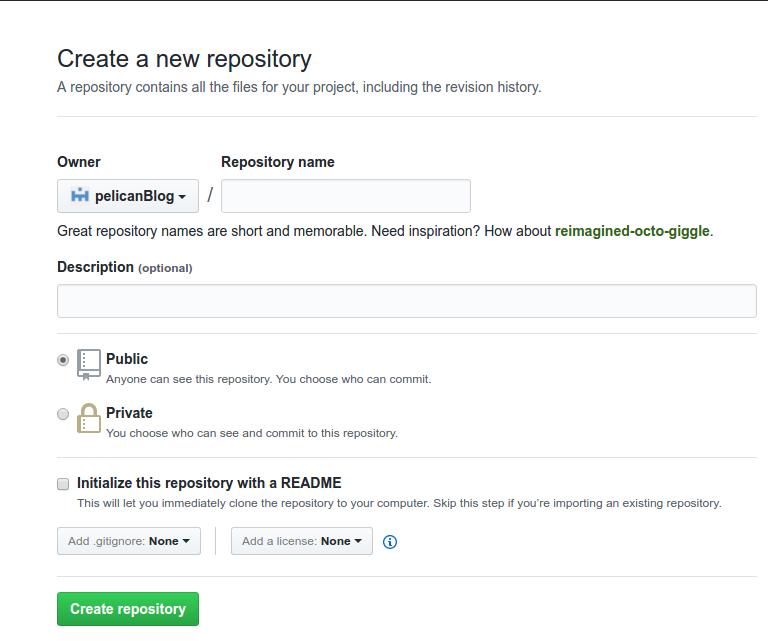 Github Pages is the way to publish your blog on to the WWW. We will have 2 repositories for doing this. One repository is for the source, which is our blog content. Second repository is for the generated files in the output folder. We all should have a GitHub account, if you have then continue, else go to GitHub and create an account. The process is very straight forward, just follow the instruction on the website. The git should be locally configured. Kindly follow the steps mention in this page Setting your email in Git. We should now create our first Repository onto github. Click on the + icon which shows this drop down. And click on the option New Repository as shown above. Since we already have a folder in our local system, to check-in we can leave this box unchecked. In future if need we can create a README file manually. Once you click on the Create Repository link, you will be taken to this page, with these as a content. This is the symbol of empty repository which is created and now we can push our local code to this folder. We can follow the instruction mentioned above to push our local code to github, but we have to make sure that we do not push the output directory in the same repository as the code, because the handling of output directory is different. Go to the root of the folder, where your blog is kept. This command initializes an empty repository in the same folder. Create a file named .gitignore in the same folder. Copy the below content to the .gitignore file. The above code basically prevents all the local temporary files and the output directory to be checked in. This command will make sure that the output folder is not tracked by git, check the output as shown below. Only files listed above will be tracked, and output directory is not one of them. Adds all the above files to be ready for commit. This commands connects the remote repository of github with our local code. The URL might be different for you. This will push the local changes to the GitHub repository we created. It will ask for your username and password, kindly provide those and we have pushed our code to github. The output folder is out actual blog, so this is a little different from the previous way of pushing code to github. Please follow along to create this special repository. 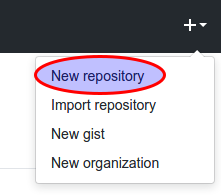 Select the same New Repository from the + icon shown in previous repository. In the New Repository form, the magic happens with the Repository Name field, fill in the name as username.github.io, where username is your github username. Now there are two ways to push the output folder to this new repository, you can follow any one of them. Push the output folder as a repository which we already know. After the above command, just launch this URL in your browser, https://username.github.io/, just change username with your username. This adds the output folder as a submodule. git commit -m "added submodule"
With this we have completed our part of the blog series. With this series of blog post we are able to achieve this. Understand what is pelican blog and how to use it with github pages. How to set up the Anaconda environment for pelican development. Understood what pelican-quickstart command does. Understood the pelican settings files and its uses. Created a github pages and pushed both our content and the blog post to it. How to configure a domain with github pages. Integration with google analytics, mail chimp etc. Modifying the blogs to get the most out of the themes.